A rainbow baby is a child born after miscarriage, stillbirth or infant loss. The term symbolizes hope that a rainbow will appear after a storm. A world of emotion captured in a just a few snaps. "Being able to be here and have her do this photo session it makes me want to cry," said mother Sarah Hannah. These images, shining light on a previously dark time for some families. "Last Cctober we actually had a miscarriage, which was tough because we had actually planned it and everything and we were super excited and told all of our family," said Hannah. On January 19th, BrenLynn arrived. "It's a huge gift to be able to find out that after having a loss we were able to have her," said Hannah. The artist behind the camera is Paige Mcleod. She photographs babies, like BrenLynn, born after miscarriage, stillbirth or early infant loss, referred to as 'Rainbow Babies'. "I think with photography, it’s just you’re creating something that’s going to last forever," said Mcleod. Every month goes to a new color and a new face. The red and orange photo sessions already given out, and now it's BrenLynn's turn to be celebrated in a yellow glow. "I just really feel like rainbow babies are really special, and their parents worked so hard to bring them into this world," said Mcleod. For Paige, capturing the images of these rainbow babies is more than just a job. "I don't like to take their pictures and say goodbye, I like to watch them grow. I like to go to their first birthday parties and take pictures of the event," said Paige. As part of her service, a hundred dollars of every session fee booked with Glean + Co. is given to The Little Joys Remembrance Foundation. It works to provide Idaho hospitals with cuddle cots, which are cooling devices that slows the physical changes of an infant after they've passed. When they first started, there were zero in Idaho hospitals. Now they have 20 and only 11 left. "Maybe they want to comb the babies hair or read a book to that baby, the cuddle cot is giving them to time to do that," said founder of Little Joys Remembrance Foundation Erica Willenbring. The cuddle cots and the photo sessions aim to increase the comfort and visibility surrounding this type of grief, and the finished product giving just a glimpse of hope after loss. "Just because you've had a loss doesn't mean it's the end of the road. Huge storm, there's always a rainbow at the end," said Hannah. 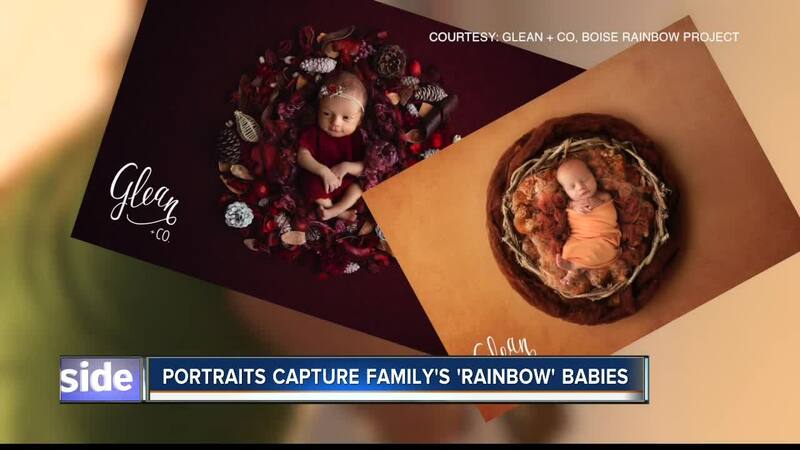 Messge from Glean + Co. and Boise Rainbow Project: If anyone watching is expecting a rainbow baby and wants to enter they can do so by following us or @shynnz on instagram or entering on our website link. The Green rainbow session will be given away at the end of February, the Blue at the end of March and the Purple at the end of April.